There are over a dozen different ‘asset classes’ in modern markets; ranging from cash all the way up to long-dated government bonds. There are also more exotic variants out there such as property, fine wines, or even art. They are bought and sold on the premise that these financial instruments will sustain investor wealth as well as providing some inherent use in their own right. So, we come to gold, oil and US dollar. 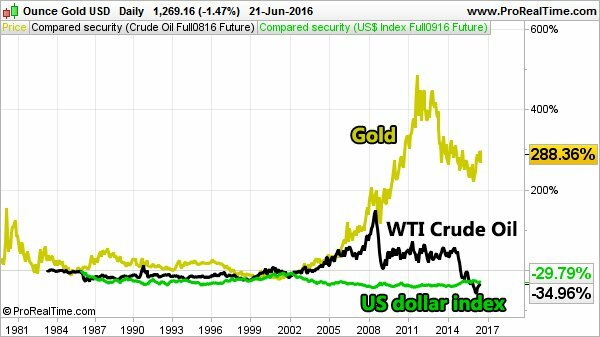 Gold is a precious metal, oil is a commodity and the US dollar is a currency. These three particular asset classes are probably the most influential (and some would go so far as to say – existential) aspects of modern financial markets. They attract the most investor attention and cause the most devastation upon national economies if their price levels stray into uncharted territory. They also happen to have intra-seasonal correlations that come and go, seemingly on a whim. Looking at the long-term historical relationship, their correlations are very sporadic with patterns often forming around other factors such as political changes, geo-political conflicts and natural disasters. The recent spat between Russia, the US, OPEC and Middle-Eastern sheiks, and the effect it had on global oil prices, is a case in point. This asset trifecta can be a great leading indicator too. In the case of gold, considered a secure store of value, its changing value often highlights the consequences derived from other proceedings in the wider world, including politics and central banking. Since the 1970’s, the Federal Reserve’s balance sheet has figuratively exploded. The very stable monetary period up until 1975, was interrupted by the removal of the Gold Standard in 1971, which led the US to sharp increases in its balance sheet, currency devaluation and higher gold prices — with gold rising almost 5,000% since 1970’s levels. 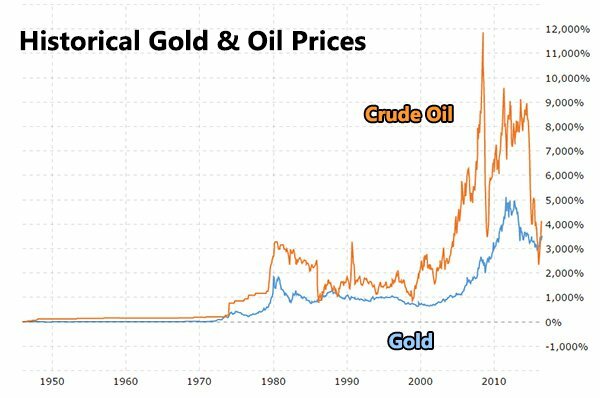 In the chart below, historic gold prices are visibly correlated to oil, with some temporary disconnects along the way i.e. in 2008 the price oil was extremely volatile, seeing huge upswings soon followed by large downswings — while gold prices remained on a gradual upward trend. Also very interestingly, the price of oil has fallen at its fastest rate in history from around $130/pb in 2014 down to as low as $35/pb this year — and again, gold prices have only marginally followed suit. Gold is an incredibly strong barometer of the wider markets, financial or otherwise. By marking various assets to gold as their benchmark over time, significant trends immediately surface. This chart shows the ratio of the gold price to the US monetary base going back to 1918. 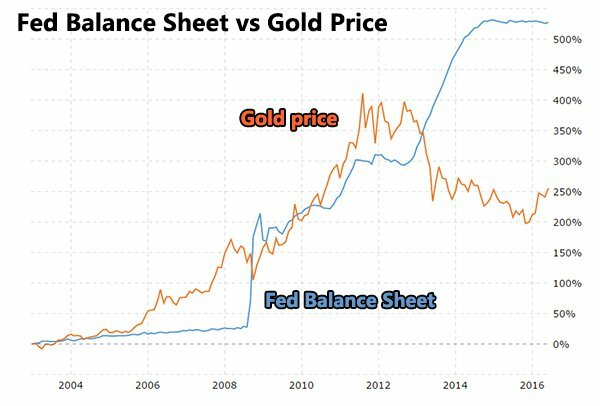 The prolonged decline with only temporary bucks to the trend, suggests that fiat paper currency is gradually taking over, with the amount of gold as a proportion of the money supply, now almost zero. 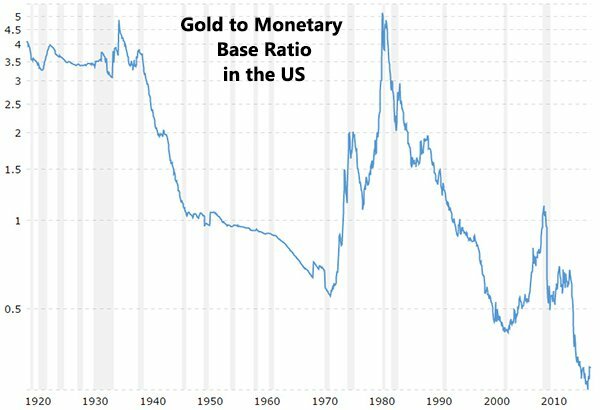 From a ratio of around 5 after WWI, the value of gold in relation to the US monetary base has been falling precipitously with a strong bounce in the 1970’s — coincidentally, occurring for 10 years after the Gold Standard was abolished. The most common excuse for the recent strength in the prices for gold and oil in the wake of the Federal Reserve’s March meeting has been the drop in the U.S. dollar, but the two commodities don’t always have an inverse relationship with the greenback. The general rule of thumb is that commodities priced in dollars often move in the opposite direction of the currency, as changes in the US dollar can influence the attractiveness of those commodities to holders of other currencies. However, seeing correlation largely depends on the time frame. Correlation this week, could be no correlation the next. Supply and demand factors are dynamic and sometime not tangible, and therefore, correlations come and go like the tides. As another anecdotal, yet insightful example — during the height of the GFC in 2007/08, both gold and oil prices were moving tick-for-tick with the US dollar, locked in an inverse relationship for several months. At the time, this correlation was attributed to hot money flows, speculative trading activity, deleveraging and futures markets occurrences such as contango and backwardation. However, looking back with hindsight, the Fed’s quantitative easing (QE) program launched in 2008 had the effect of marrying the US dollar to oil prices because it was QE that was responsible for keeping equity markets stable, and keeping oil-centric input costs low in the process. In the here and now, the most visible common thread between Gold, Oil and US dollar has been rising volatility. Higher volatility is not necessarily linked to any one specific commodity in terms of its supply and demand conditions, but more so a reflection of greater speculative activity. 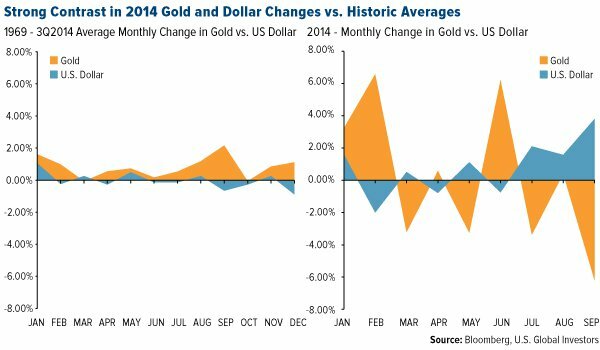 Between 1969-2014, correlation between gold and the US dollar was broadly holding and volatility was broadly low. However, since 2014, the correlation has become rather more erratic, with volatility returning to the same sorts of levels seen in the dark days of the GFC. All other things being equal, a rising dollar means a falling gold price over the short term, and especially during periods where inflation isn’t a concern, then gold and the dollar do trade in a generally inverse way. But in a period where all fiat currencies are undergoing significant money supply expansion and the public is concerned about the repercussions, gold can trade higher in all currencies — even the US dollar. In this scenario the correlation between the US dollar and gold could potentially switch from inverse to direct. It is worth noting that where the markets are now, is also, where they have been before. In October 2011, a correction occurred in energy, commodities and resources stocks based on European and Chinese growth fears. But international economic stimulus measures helped raise market confidence. So again today, we’re seeing intermittent market sell-offs that some would accept are corrections, while others, claim they’re nothing more than ‘profit-taking’ or ‘trimming positions’. If more central banking stimulus isn’t forthcoming, there is a strong possibility that equity valuations cannot be sustained, and therefore, could mean lower prices and lower aggregate demand. On the flip side, if more QE is provided — that entrenches the current status-quo where fiat currencies are effectively being eroded by inflationary monetary policy. In modern markets (possibly due to their highly speculative nature compared to the past) perceived correlations are often interpreted as causation. When in reality, those correlations were actually coincidental and transitory. 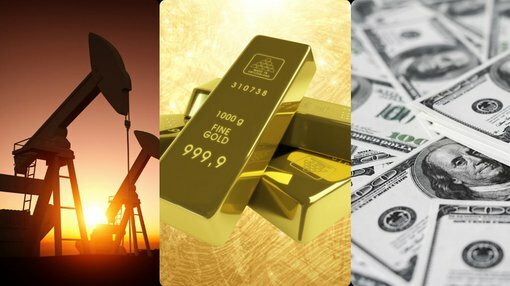 Is it possible that Gold/Oil/USD are linked not so much by causation, but more so, by inter-linked investor sentiment and scores of investors utilising the three respective assets interchangeably in their portfolios? If you are considering jumping into these three particular asset classes, bear in mind they are not as strongly inter-linked as it would appear (correlation volatility is rising) — although that doesn’t stop market speculators from assuming otherwise. Correlation, causation and coincidence are three different things, and investors should know the difference before venturing into these highly volatile, yet fundamentally precious assets most investors know and love.